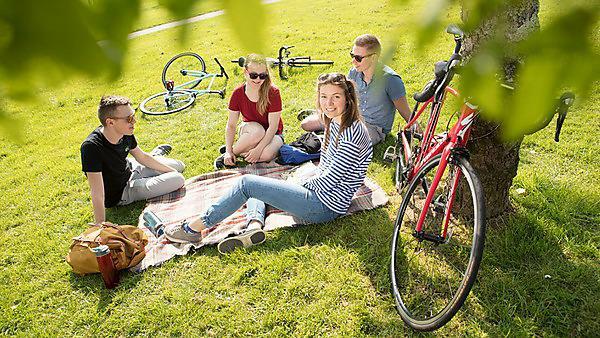 / Home / Student life / Magazine / Issue 6 / Competition – win a hybrid bike! The closing date is 31 July 2017. Struggling for the answer? Visit the link below, where you can also register your interest in attending one of our open days. This competition closed for entries on: Monday 31 July, 2017. Competition entrants should be 16 or over. Promotion excludes Immediate Media and Plymouth University employees, their friends and families. By entering, you agree to be bound by all the rules of the promotion and to send Plymouth University a photo of yourself with the bike within one week of receiving it, for use in the magazine and on social media. One entry per person per competition allowed. No responsibility accepted for lost, delayed, ineligible or fraudulent entries. Please direct queries to outreach@plymouth.ac.uk or call +44 (0)1752 585858. Winning entries will be chosen at random from all eligible entries. Winners will be notified within 28 days of the closing date. The draw is final and no correspondence will be entered into. For details of winners send a SAE within two months of the closing date. If any winner is unable to be contacted within one month of the closing date, the promoter will offer the prize to a runner-up. The promoter reserves the right to substitute with one of the same or greater value. There is no cash alternative. By entering you are agreeing to receive future information from Plymouth University. If you don’t want to receive this information please tick the relevant box on the web form. Promoter: Immediate Media Company Bristol Ltd/Plymouth University. UK and Channel Island entrants only.